You may have guessed that I’m going through a ukulele phase from my previous post. Today’s post is more random information and thoughts on ukulele. I currently own two inexpensive ukuleles but have been researching better – but not too expensive tenor ukes. If I sell a guitar or other instrument, I can get a new tenor ukulele. 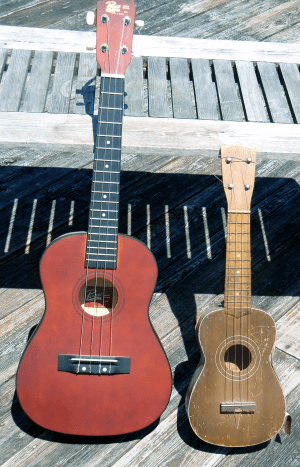 Why get a Tenor ukulele over a Soprano or Concert sized instrument? Generally the larger the instrument the louder it sounds – but maybe not. So many factors go into sound this is more a generalization that typically is true, but not always. A larger instrument probably will also sound fuller as well as louder. Lower pitched harmonics give the sound a “richness” that I enjoy. More room for fingers because of wider fret and string spacing. Most guitarists (such as myself) find this easier to adapt to. Why buy a Soprano or Concert over Tenor Ukulele? Turning the above question around – what are the advantages of the smaller instruments? Loud enough (or maybe louder). You just like the size, shape and feel. In other words, there are good reasons for either the smaller or tenor sized instruments. But my current desire is for a tenor. Remember, I already have a soprano and a baritone. Why consider an inexpensive ukulele made from laminated woods? Because you don’t need to store it in a case or worry about it being damaged. Of course your uke may last longer if you keep it protected. You’re more likely to leave it out where you can play it – so you will play it more often. More likely to bring it with you (beach, hiking, travel) – so you will bring and play it more often. If you aren’t sure you’ll like playing the ukulele, then no big financial loss. Laminated wood construction is (probably) more rugged than solid wood. Takes a bang and keeps on playing. Why consider a more expensive ukulele made from solid wood (or at least a solid wood top)? Tone. Generally, solid wood will have nicer tone than laminated wood. Volume. Generally, solid wood will have louder volume than laminated wood. Looks. More expensive woods can be quite beautiful (though some pretty wood can be found in laminated models too). I personally want a nice sounding instrument. My incredibly inexpensive baritone, made from laminated wood sounds dead. Having played guitar for over 50 years, good tone is one of the things that I get pleasure from when playing. That said, I don’t want to pay a lot. I tried some tenor ukulele’s this past weekend and found a Kala KA-T laminated mahogany tenor that sounded very nice. I played a solid mahogany model from Kala that cost nearly double. It might have sounded nicer but not twice as nice. I am still looking for the proper compromise between price and sound. The following is a slightly more expensive model than the one I tried. This links to the SamAsh product page for the KA-TEM Exotic Mahogany Tenor Ukulele. But search for the Kala KA-T to find the model I played. Low G or High G tuning? Traditional Hawaian ukulele music uses reenterant tuning. Ukuleles originally made for this tuning and many think chords sound better when a ukulele is tuned with a high G for the 4th string. Many songbooks assume this tuning will be used. Fuller sound with more lows (bass). Increases range of ukulele (5 more low notes). How can you put tenor strings on a baritone uke? Glen Rose plays jazz ukulele and has a website, JazzyUkulele. He indicates that in his videos he often uses a baritone ukulele tuned as a tenor. The advantage for instruction is the greater finger spacing on the baritone is easier for students to see in the videos. But there are other reasons you want to try this. Or not. Tuning a baritone set of strings up to C tuning is not the thing to do. That would cause too much tension on the instrument. Going from 17 inches to 19 inches (tenor to baritone scale length) but keeping the tuning the same (GCEA) causes the string tension to increase by 125%. Reducing the pitch of the C string to Bb causes a change in tension of 80%. The other string tensions are also reduced by about this amount. The net effect – the increased length and lowered pitch cancel each other out and the net tension on each of the strings is approximately the same as when the strings are on a 17 inch tenor tuned GCEA. (See this post of mine “Scale Length: Myth and Math” to see how I calculated these tension changes). Although I try to avoid singing where humans can hear me, one of the advantages of the Bb tuning is that this is the key my voice wants to be in when I sing. If you do try tenor strings on a baritone, be warned that tenor strings may not be long enough to fit a baritone. Some strings come in extra long lengths (like Worth strings). I put on an Aquila tenor set on my baritone and there was just enough length to fit the strings. My opinion is that any instrument is better when you can play jazz on it. So what about jazz ukulele? There are jazz ukulele players. Maybe the first was Lyle Ritz. He recorded some jazz ukulele albums in the 1950s. The good news if you’re interested in learning this style is you can buy music books with jazz standards as jazz chord melodies as Lyle Ritz played them. I’ve seen a several youtube videos of “Don’t Get Around Much Anymore” on ukulele. They are all variations on Lyle’s arrangement (in the second book below). The shapes of the chords stay the same but the names change if your ukulele is in a different tuning. The top row below shows the harmonized scale in the key of C for standard tuning. Below are the names for these shapes if you have a ukulele that is tuned to one of the other tunings mentioned. Note that the baritone chord names are also the names to the shapes guitarists know for the high strings of the guitar. Next Post:Where to buy a guitar, mandolin, banjo, ukulele …?